As we moved in, most things that didn't have a specific home went to live in either the basement or the attic. I did my best to make sure it was one or the other based on proximity to it's eventual resting place. I didn't want something being put in the attic if it was going to end up in the basement or even the first floor. Mostly i was trying to avoid having something be moved up and down the stairs more than once. It was easiest to put things in the basement and either leave them there or move them one time to their home. Our basement looked like the picture. Eventually things found their homes and after Nightingale got her book/display case, I decided it was time for some downstairs furniture. I didn't want to actually spend any more money than I had to, but at the same time it's hard to invite friends over and have them sit in lawnchairs. That should be strictly for the gin swilling that will occur once our garage still is complete. So I've wanted this furniture set for a long time. Unfortunately, we could not get the entire set to fit in our basement without looking like clown furniture, so I settled for the sofa, otterman and a chair and 1/2 that has yet to arrive. 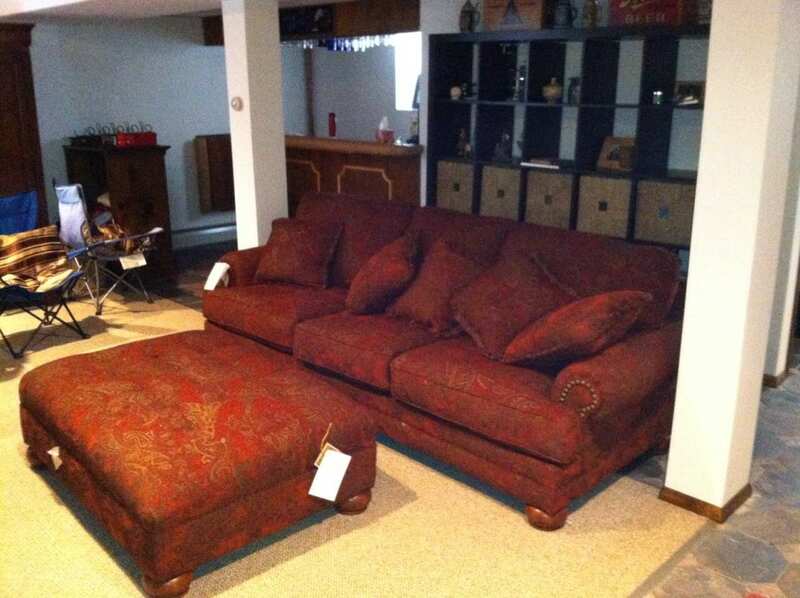 I was toying with getting the loveseat for upstairs but there really isn't any reason to spend the cash right now. When I first discovered this furniture set at Ashley's it was pretty expensive. Now that it has gone through their stock and rotated into their outlet stores, the price has dropped. There are several sites I could order the complete set for half of what it would have cost me in the store 5 years ago. I didn't get the best deal but I did good. It's very hard to be on your A-game all the time. That is especially true when it comes to buying anything. We strive to find the balance between getting the best deal possible and getting something we desire, such a new sofa. At the same time, I begrudgingly acknowledge that isn't always going to happen. You buy something and a month later its a 10% cheaper. Basically my latest adjusted algorithm is to try and do our best most of the time so that when life throughs you a curve ball you can afford it. Our agent found us a renter for my condo but it will be another month before I start seeing revenue because the first month is finders fee. Even then I'm still paying a small money out-of-pocket to cover the cost of the condo but at least it's significantly less then if I let the unit remain unrented.